July 1st is Canada Day! Similar to the United States’ July 4th, Independence Day, Canada celebrates it’s birthday each year on the first of July. There is a big celebration at the parliament buildings in Ottawa. All across Canada people get together enjoy a pop or two, have some barbeque, and light fireworks once the sun goes down. It’s a great day where everyone can look at each other with pride knowing that they at least have one thing in common. They are Canadian! It hasn’t always been this way however. Back in 1868 Governor General Lord Monck signed a proclamation creating a union of the British North American Provinces under the name of Canada. It wasn’t until 1879 that a holiday was officially established and at that time it was named Dominion Day. Although the holiday existed there was no official celebration organized until the 50th anniversary in 1917. Not until 1958 has the government arranged some manner of celebration each year. 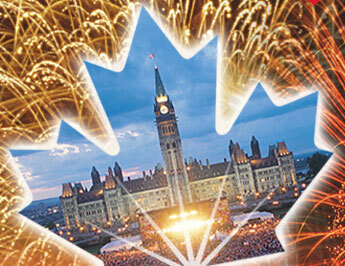 In 1980 a national committee was put together to arrange the festivities of Canada’s birthday. Since then the holiday has manifested into a huge across the country party with bands traveling from coast to coast playing in each province as some point during the day. In 1982 the holiday was officially changed from Dominion Day to Canada Day. If your not from Canada and wondering what to do July 1. Call up your friends, grab some Canadian beer, and just enjoy the day and their company. If you ever want to go on a vacation remember you will always find friends in Canada!